The Yellow Pages industry today launched an upgraded website at www.yellowpagesoptout.com that allows consumers nationwide to easily manage the delivery of phone directories. The website, developed by the Yellow Pages Association YPA and the Association of Directory Publishers ADP, gives consumers a single location to select which phone directories they receive, or to stop directory delivery altogether. What it means: with the new Website, US residents can now easily opt-out (or select delivery) of any print Yellow Pages book delivered to their door in one convenient location. 158 publishers are in the site database. To opt-out, simply enter your zip code on the home page. 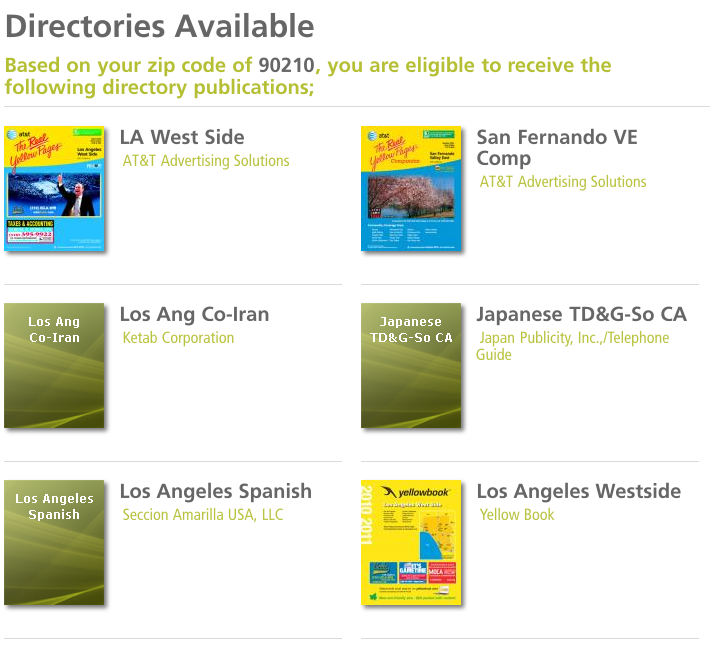 You then get a page showing all directories delivered in your zip code with pictures of the covers to eliminate confusion. The association does a nightly update to directory publishers. I think this improves the opt-out process drastically. It’s important that the industry self-regulates given the pressure coming from various cities to create regional directory delivery law (read about the Seattle situation). In a discussion yesterday with Neg Norton, President of the YPA, I suggested that the association should penalize publishers who don’t respect the opt-out (even by mistake) and this should be publicized to the public. I think the industry should also crack down on bad distribution practices. Everyone has seen those piles of Yellow Pages books being dropped on the first floor of an apartment or an office building. It took me two seconds to find someone who had recently posted a picture on Twitter. These inefficient distribution methods hurt the industry. By the way, if you live in Canada, the opt-out form is here. Next > The Evolution of Merchant "Presence"
Great move by the US industry! In Canada, Yellow Pages Group implemented an opt-out program back in 2009 and we’re continuously working to improve it for users. More to come. 😉 Thanks for including the Canadian YPG opt-out link if someone doesn`t want to receive the YP print directory.